Tether is a small but strong retaining device released by a reloadable pyrotechnic charge. 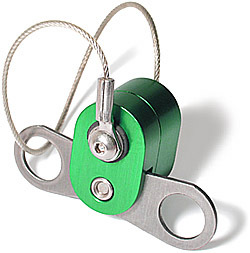 Tether is machined from 7075 aluminum with all stainless steel components. Tether only weighs 1.7 ounces prepped, fits in a 38mm airframe, and is able to hold and release under 500 pounds of load. Tether has many uses, but its most popular use is to achieve two-stage recovery with one compartment. You can modify any existing altimeter-controlled rocket, without structural modification, to take advantage of drogue-at-apogee/low-altitude-main deployment, on the range in just minutes. Tether was the 2001 winner of WildHobbies.com Reader Choice Award for Rocketry Innovation of the Year. Tether is manufactured in the United States of America. Photo gallery description of the preparation and operation of Tether. Printer friendly Adobe Acrobat PDF (196k) version of the above photo tour. Short QuickTime (1.8m) movie of a test fire. Read some of our favorite stories about projects that use our Tether. Why are the Cup and Lid so loose? build-up of residue from binding so they can move freely when needed. anything else that may cause the adhesive of the masking tape fail. so you can see first hand what will be happening in flight. on the second page of the Rapid Start. Do any parts wear out? badly it will be exposed to hot gases when the triggering charge occurs. One will mostly likely last for anywhere between 4 and 7 uses, and we provide two. This part is commonly known as a well nut or expanding nut and can usually be found at most any hardware store. and that it uses a #8/32 thread to insure compatability with existing parts. All of the other parts are designed to withstand normal operation for a very long time. Tether and all Tether components are currently in stock. You may visit our Store to purchase Tether online using PayPal. you may download an Adobe Acrobat PDF (74k) version of our order form.